Newell A. Eddy (Jr.) built Presque Isle Lodge in 1920. The Eddy family had several generations of carpenters and a “Pioneer style” of furniture making dating back to Colonel Johnathon Eddy circa the French/Indian War. The Lodge’s collection of furniture is significant as it relates to the Arts & Crafts discipline commonly referred to as the “Prairie School”. 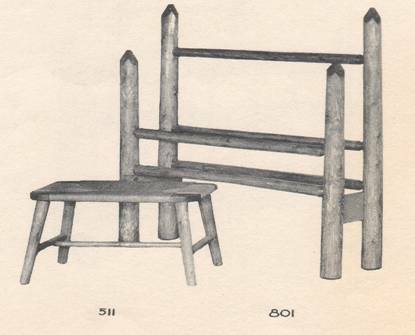 The first pieces of furniture of the “Habitant Shops, Inc.” were made at the Lodge. The Eddy’s, being from Bay City, and already a business family with a boat manufacturing business, had the facilities that lent themselves to the production of furniture. Demand for furniture outpaced the ability to hand-make the pieces as they were at the Lodge, thus the machine became incorporated. The machine methods and time saving details dropped over the years which led to the more familiar style that today’s generation is familiar with. It is the early “Lodge, Hand Made” pieces, such as a majority of the Lodge’s collection where the significance of the company’s history is to be discovered. This furniture is referred to as Habitant Log Furniture. The over 10,000 square foot Lodge contains the largest known remaining collection. Kathryn Bishop Eckert lists the Presque Isle Lodge in the Society of Architectural Historian’s Buildings of Michigan. At the time of the Lodge’s construction, it became the fourth large resort/hotel in the area, following The Birch Hill Hotel built in the late 1890s and opened in 1901 (subsequently torn down in the 1960s), the Fireside Inn in 1908, the Grand Lake Hotel built in 1912 (subsequently split up, scaled back, and reverted to a private residence) and the Colony Bar of the same general era, which burned down. These four large resort/hotels accommodated the many summer visitors to the area prior to the establishment of subdivisions and seasonal/year round homes. 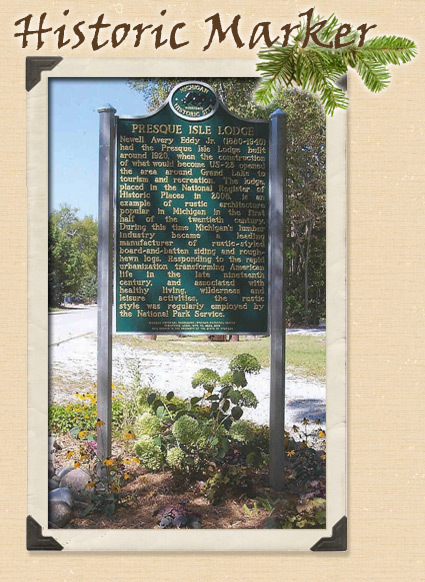 The Fireside Inn has the distinction of being the only one of these resorts continuously operated since its inception. 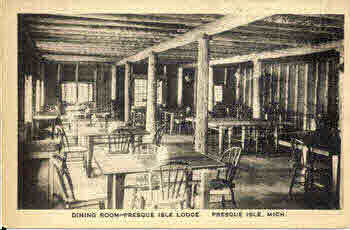 The Presque Isle Lodge was closed from 1978 to 1989 when it re-opened as a Bed & Breakfast Inn. Over the years the Presque Isle Lodge has served the community well – hosting fund-raisers for the Grand Lake Association and Friends of the Library, banquets for the Fire Department, and many reunions , showers, wedding and anniversary celebrations. The Lodge also hosts the opening night reception for the Wooden Boat Show. The Presque Isle Lodge Bed & Breakfast Inn cordially invites you to stop by and visit this historical building. 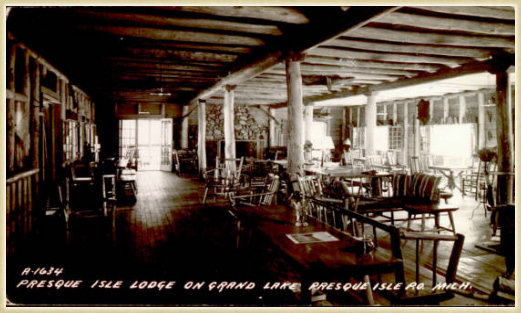 Nostalgia Thanks to some serious pack ratting, generous gifts, and the power of the Internet, we have been able to collect some fantastic pictures of the Presque Isle Lodge at various points in history. Twelve years ago for the pleasure and accommodation of vacationers, I constructed a summer resort, known as Presque Isle Lodge on beautiful Grand Lake, twenty miles deep in the woods north of Alpena, Michigan. Instead of building my lodge on the stereotype plan of the conventional summer resort, I built it along Colonial lines followed by the American woodsman who constructed his home as a fortress against frontier perils. In so doing I created a thing of simple beauty. Inside and out, the Lodge typified in architecture and construction, the civilization of the “Habitant” – the pioneer, the son of soil- plus, of course, every modern convenience and comfort. However, when this beautiful building was completed I found only half of my problem solved. The question of interior furnishings demanded serious consideration. Obviously products from high speed lathes and mills of modern furniture factories had no place in the Presque Isle Lodge. Only solid, substantial furniture faithfully fashioned to the standard of honest simplicity that characterized the household belongings of our American forefathers would be compatible to this quaint colonial setting. At the same time, of course, whatever furnishings we chose had to be durable, inviting, and comfortable. The furniture consequently, could not under any circumstances, be of the modern machine-made type. It was impossible for me to use machine-made furniture in the Presque Isle Lodge and still retain its novel, early Pioneer atmosphere. I had to have furniture peculiar to this early American type building. I had constructed an ideal and it could never be perfected ideal until it was correctly furnished. A tour of furniture supply sources throughout the East and Midwest convinced me that there was no such type of furniture available to conform to the rigid standards that I had set for Presque Isle Lodge. Therefore I decided to build my own. With several of the same patient, expert craftsmen who had helped me build the Lodge, I began the construction of early American furniture. We kept reference books constantly before us in our workshop to insure close adherence to authentic styles. We worked hard and we worked long. We built tables, chairs, dressers, beds, settees- we even built mirrors, lamps, bookshelves and numerous other accessory pieces to complete the entire Lodge furnishings. When it was finished and installed our furniture met with the instant approval of the guests. 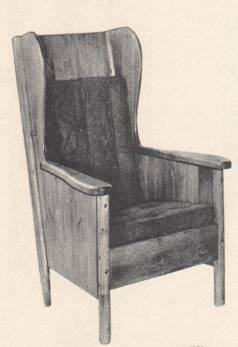 During the first summer of 1920 and the summers following, the Lodge and its furnishings not only drew our customers praise, but it also elicited orders from many who wanted Knotty Pine furniture for their own homes. Although this development was not part of my original plan, I could not deny my visitor’s requests. And so the construction of Habitant Knotty Pine Furniture began in a small shop behind the Lodge. As the years rolled by a new type of industry developed. Habitant Knotty Pine Furniture today enjoys an ever increasing prominence in the foremost furniture centers. The superiority of authentic design and construction makes Habitant Furniture the growing choice of Americans who take pride in quietly displaying their heritage within their homes.